File photo of Joe O'Toole. THERE HAVE BEEN multiple calls from political parties for the resignation of the head of the expert commission into water charges. Fianna Fáil and the Anti-Austerity Alliance have both called for the chairman of the commission Joe O’Toole to step down in the wake of comments he made about water charges. Sinn Féin has said that he must withdraw the comments he made. In an interview with the Irish Examiner, O’Toole expressed his support for water charges and the polluter-pays principle, which opponents to the charges believe makes his position untenable. He also said that people like AAA-PBP were “completely and utterly wrong” on the issue of water charges. O’Toole’s comments provoked a strong political backlash from parties opposed to water charges. AAA-PBP TD Paul Murphy called for his immediate resignation, saying that the commission was a “set up” to get the result the government wanted. “I and others have no faith in the Commission,” said Murphy. However, for others who were prepared to give it a chance – his comments and continued chairing of it show that it is nothing more than a set-up to get the right answer for the government. Joe O’Toole should resign immediately. If he refuses the government should consider his position if they want the public, who already have little faith in this commission, to accept anything it recommends. Fianna Fáil’s environment spokesperson on housing, planning and local government Barry Cowen called the comments “ill-judged” and said they had “seriously undermined” his position as chairman of the commission. “By making clear his view before the process of examination even begins and pre-empting the outcome, he has raised serious question marks about his suitability for this role,” said Cowen. Meanwhile, Sinn Féin’s water spokesperson Eoin Ó Broin said that O’Toole should retract the comments. “The majority of TDs elected to the 32nd Dáil were elected on an anti-water charges platform,” said Ó Broin. For the expert Commission to have a level of credibility, Mr. O’Toole must now retract the comments he made this morning. In relation to my personal views expressed in a recent media interview, for the avoidance of any doubt I want to reassure people of commitment to being completely impartial and open minded in my role of commission chair. The expert commission was established to determine the future of water charges in Ireland. 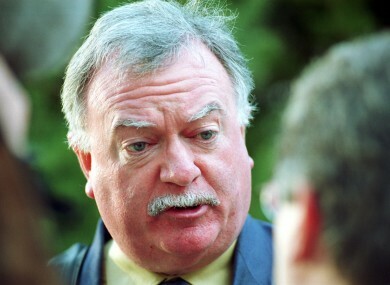 Joe O’Toole is a former senator and trade union representative. Read: FactCheck: Who uses water most, and who pays most of the cost? Email “Multiple calls for head of water charges commission to step down over "ill-judged" comments”. Feedback on “Multiple calls for head of water charges commission to step down over "ill-judged" comments”.